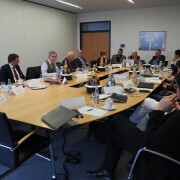 The Expert Committees of the the EGTC are responsible for initiating projects that serve the Joint Strategy for the development of the Rhine-Alpine Corridor. 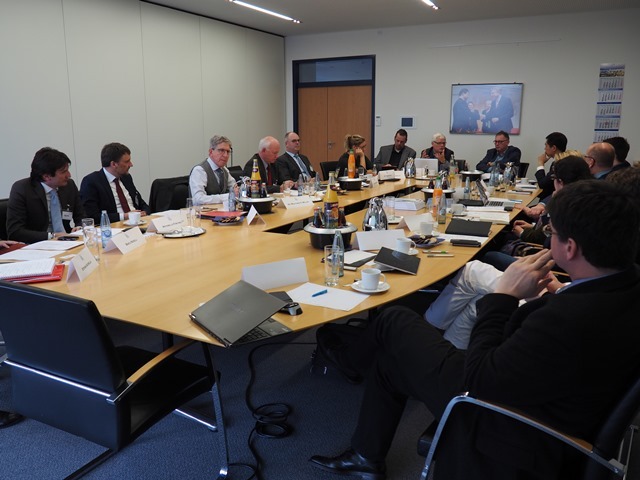 On 8 March 2017, the 2 Expert Committees met at the Port of Duisburg to discuss ongoing and planned projects. The presented projects and initiatives ranged from developing a seamless travel chain for passengers between Urban Nodes in the Corridor over more sustainable freight transport through multimodal freight bundling or intelligent use of alternative fuels along the entire Corridor to rail noise monitoring. Not only projects within, but also to/from the Rhine-Alpine Corridor were discussed. The Expert Committee “Spatial and Transport Planning; Economic Development and Logistics” chaired by Dr. Wolfgang G. Müller had a special guest contribution by Mr. Leonardo Vender from the Far East Land Bridge FELB. FELB operates freight trains between China and Europe with transit times of 14-16 days. In the Rhine-Alpine Corridor, Duisburg is the main destination for FELB because it is the largest international hub in Europe. In the Expert Committee “Environment and Energy” chaired by Josef Offele, especially project initiatives on rail noise and inland waterways were discussed.